With SBI’s line of pGreenZeo, pRedZeo, and pRedTK Differentation Reporter Vectors, you can monitor stem cell differentiation in real time. These vectors leverage our reliable lentivector technology and save you time—our pre-built differentiation reporters come as ready-to-package lentivector plasmids or ready-to-transduce pre-packaged lentivirus. 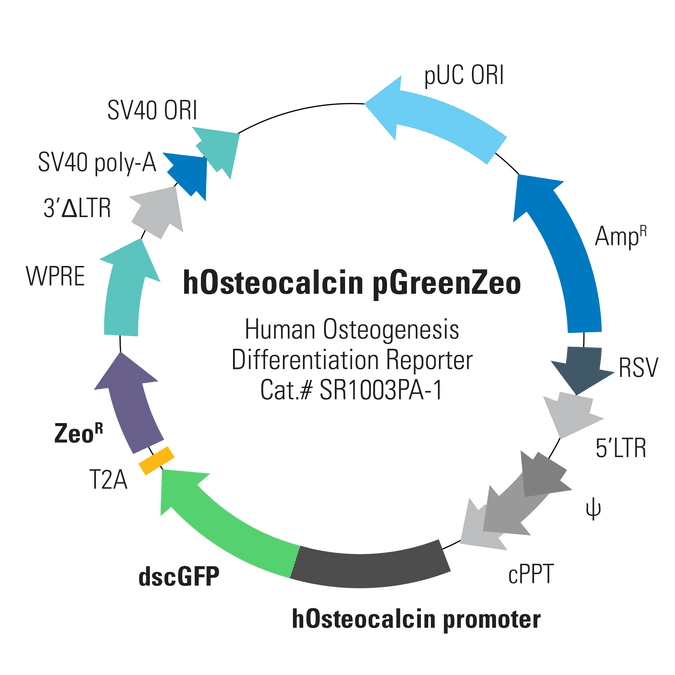 The Human Osteocalcin pGreenZeo Differentiation Reporter co-expresses dscGFP (destabilized copGFP, 2-hour half-life) and zeomycin resistance from the human osteocalcin promoter/enhancer elements, enabling visualization of osteogenesis using GFP fluorescence and selection for the desired cells using zeomycin. Please note that these vectors only function properly when transduced. Transfection keeps the constitutive RSV promoter intact, leading to nonspecific expression of the reporter genes. Figure 1. Live imaging of neuronal differentiation. Ravin, et al, used SBI’s Human Nestin pGreenFire Differentiation Reporter (Cat.# SR10016VA-1), which drives GFP expression from the glial fibrillary acidic protein promoter, to watch human neural stem cells differentiate into a network of mature neurons, oligodendrocytes, and astrocytes over the course of seven days. The periodic “flashes” seen in this video correspond to fluorescent photos taken of the growing cells to identify the GFP signals. The final photo taken after the network formation is shown below the video (color added). Among the network of neurons, only the astrocytes are bright green, demonstrating the specificity of SBI’s human Nestin pGreenFire Differentiation Reporter.